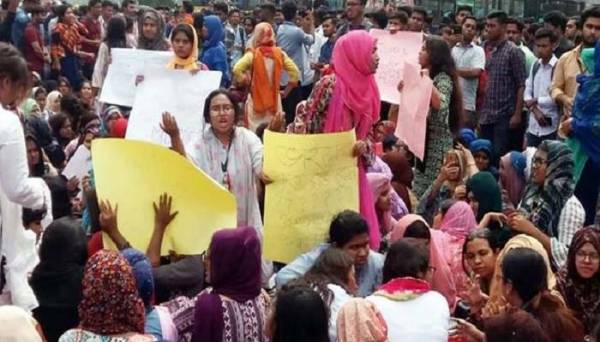 The protesting students demanded 8-point demands including the cancellation of route permit of ‘Suprovat Paribahan’ bus in the incident of killing an of university student Abrar Ahmed Chowdhury at capital’s Pragati Sarani. The protesters demanded these by blocking the road in front of the capital's Jamuna Future Park on Tuesday noon. In the morning, Abrar Ahmed Chowdhury, a student of International Relations Department of Bangladesh University of Professionals (BUP) was killed in a road accident. A bus of ‘Suprovat Paribahan’ ran over him while Abrar crossing the road in Bhatara area. Police arrested the assailant bus driver. At one stage of the movement of students, Dhaka North City Corporation mayor Atiqul Islam went to the spot requesting to withdraw the blockade, but they did not accept it. He assured a strict punishment of the bus driver and makes a footover bridge after the deceased student's name, but the students continued the movement. 1. The transport sector must be free from political influence. A bus driver's license and every necessary document must be checked every month. 2. The detainees and the involved people will be subjected to the maximum punishment. 3. Non-fitness and non-licensed driver needs to be removed quickly from today. 4. Underpass, speed breaker, and footover bridges should be constructed at all risky and necessary places. 5. All the people involved in the killing on the road will be brought under the law. 6. Make proper arrangements for the bus station and built passenger roofs by stopping the competitive traffic movement. 8. Permanent discharge of the negligent administration and traffic police in charge. Mayor Atiqul Islam came to the spot on the spot and said the country's current law will ensure maximum punishment for the bus driver. No buses of ‘Suprovat Paribahan’ will be allowed to run on that route. A footover bridge will be constructed there in the name of deceased Abrar within three-four months. He also said that the bus services will be brought under a student six to seven organizations very soon. Later, he urged the students for withdrawal of the blockade but the students did not respond. Then the mayor left.